These bobbins are the ones I include in my basic kumihimo kit. 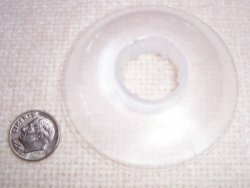 They are about 1 3/4 inches in diameter. They're great for any project that use long strands. Sold individually. 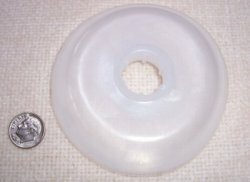 These bobbins are about 3 1/2 inches in diameter. They're quite large and I use them only when working with really heavy textiles or am making an extra long braid, say for a lariat. Sold individually. Use these bobbins when your project calls for a really long strand of beads or beads that are larger in size than size 6o. 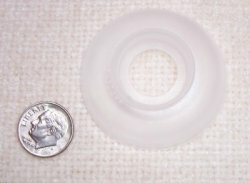 These bobbins are about 2 1/2 inches in diameter. Sold individually.